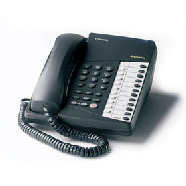 Toshiba NON Display Digital Handset Features includes - 12 Programmable keys with dual function LED's. There are also 10 programmable keys without LED's (these can be used for extensions and speed dialling facilities). The phone has Hands Free dialling and speech. This phone can be used on the Toshiba DK280, CT, CTX, CIX, Strata DK280, Strata CT, Strata CTX, Strata CIX, Strata IP-CTX and the Strata Pure IP-CIX telephone systems.